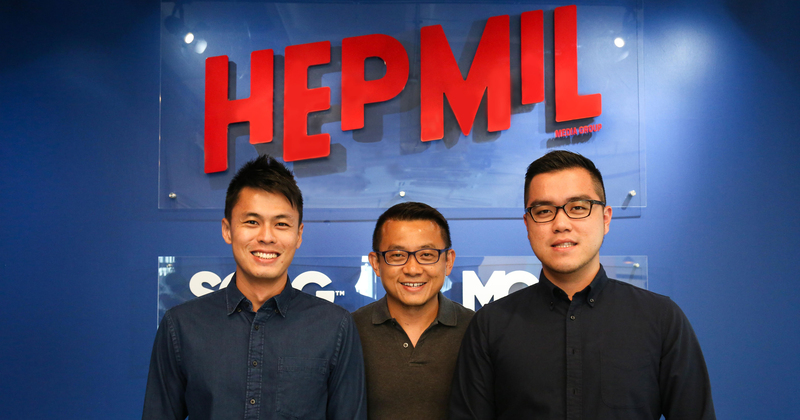 Hepmil Media might not be an immediately recognisable name by the regular Singaporean and Malaysian, but their brands and their founders Karl Mak and Adrian Ang – who recently graced the Forbes 30 Under 30 list – definitely are. SGAG and MGAG, which connect with over 2 million Singaporeans and 8 million Malaysians on a weekly basis, are subsidiaries of the media company which has just announced its securing of SGD$1.3 million in a Pre-Series A funding through angel investors on 5 September 2017. The angel investors weren’t named, but it was revealed that their backgrounds span various industries, disciplines, and geographies. Adding onto the funding news, the Hepmil board also sees Jeffrey Seah, former ad-man, taking on the role of Vice Chairman of the board. Prior to this, Seah was the Group Advisor to Hepmil’s Chief Executive Officer and Chief Creative Officer, Mak and Ang, from August 2016. He will work to enable quick entry into new markets and deepen footprints in existing markets. The funds raised will be channelled towards expansion efforts and product development. There will also be a concurrent focus on the augmentation of platforms and audience data applications. But how did the dynamic duo meet the (very) establishment ad-man, and are they looking at collaborating with even more brands? I got in touch with Mak, and found out more. VP: First of all, congrats! What are some upcoming plans that we can look forward to? Mak: We will be exploring opportunities to create different types of content through new brand offerings that will continue to serve this mission to our audience. For our existing brands (SGAG & MGAG), we are also in the midst of exploring partnerships and integrations to extend our brand offerings to the next level. What do you think is the winning formula that has helped Hepmil’s brands grow so quickly? Our team has worked tirelessly and fearlessly in the past few years. We believe that it’s because of the amazing people that we work with each day that has allowed us to get to where we are today – their crazy ideas, willingness and ability to execute at break-neck pace. What are the areas that you’re looking to forward with these funds? We are exploring other S.E.A markets as possible next ports of entry. For existing markets, our focus will be to go deeper into our existing platforms to have a deeper understanding on how to create better content for our audience, which in turn will help us create more impactful branded content with partners. We will also be exploring integrations with technology partners to improve engagements and conversion metrics for our client campaigns. Are you looking to collaborate with other digital brands? If so, on what areas? We’re still in our infancy stages with brands from industries such as beauty, tech, lifestyle categories. We’ll be looking to see if there are any opportunities to expand our content offerings to partner with a wider range of brands from these industries. How did you and Jeffrey Seah get acquainted? This is probably one of the most random stories you’ll ever hear. I was queuing up for coffee in the CBD one morning and saw that famous silicon valley entrepreneur, Brian Wong (Kiip), was in front of me and struck up a convo with him. I passed him my name card and we went our separate ways. Apparently Brian was about to have coffee with Jeff and my name was brought into the convo. Coincidentally, Jeff had been wanting to meet the guys behind SGAG so he took my contact from Bian and dropped me a note. What were some of the common areas that both Hepmil and Seah have in common? Jeff is often described as a Singaporean force of nature in the advertising industry in the S.E.A markets. This is something we aspire to become collectively as a group, so naturally there was a good fit from the get go. With both parties being, 100% Singaporean, he was able to understand and appreciate our content which was a huge plus and quite rare for someone so senior in the corporate world. What are some of the key areas that Jeffrey will be helping with? The wealth of experience he has in the advertising industry across the region is a huge value add factor for us. S.E.A is a complex region with great intricacies in both the content and business side of our business. Having someone who has gone before us and achieved great success in his career in the same industry that we operate in allows us to achieve scale at a faster pace. On a personal front, Jeff has provided a great deal of mentorship for Adrian and myself in the areas of leadership. We’re in the stage of our careers where learning to balance our work life with family life and he’s been a pivotal role model for us. Do you have a shoutout to followers of Hepmil’s brands? All of you have been absolutely amazing. Each like, share, comment, email, dm means a lot to us and we will strive harder to each day to continue to make sure that you laugh, cry or smile whenever you see our content in the days to come.